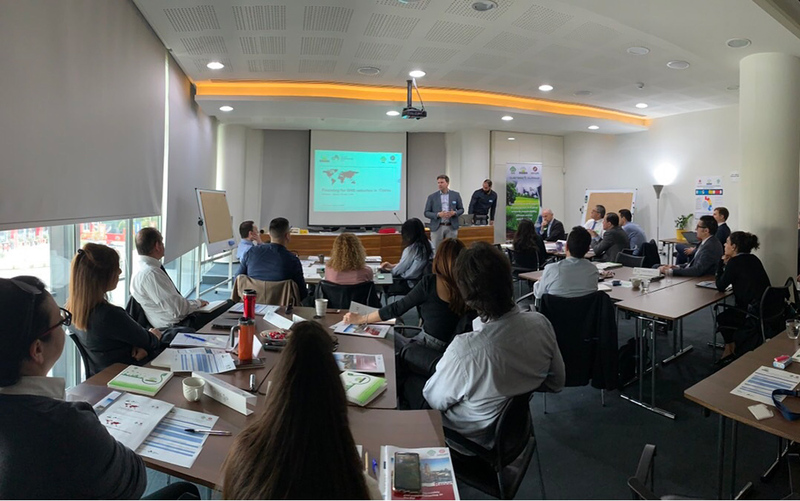 The Cyprus Employers & Industrialists Federation (OEB) and adelphi Research organized two capacity building workshops on Financing Greenhouse Gas Reduction, that took place on the 9th and 10th of April 2019. The capacity building workshops were attended by representatives of banks (9th April) and governmental officials (10th April), with the aim of supporting them to identify financing models and support schemes for cleantech and emissions reduction projects until 2030. The participants had the chance to identify opportunities for new financing products and internal and external drivers, learn about existing climate and energy efficiency financing products and prototype low-carbon and cleantech financing products. The organization of the workshops was part of the activities of the Business4Climate + project, which aims to develop a roadmap for financing projects to reduce greenhouse gas emissions in businesses in Cyprus, with the ultimate goal of incorporating this into the national climate and energy strategy 2030.